WILKES-BARRE — The Westmoreland Club in Wilkes-Barre has purchased the old First Baptist Church at 48 S. River St. and plans to preserve and restore it to use for weddings, dinners and other events. Robert Williams, general manager and chief operations officer at the Westmoreland Club at 59 S. Franklin St., said the club purchased the church for $125,000 and just closed on the sale. The church can hold up to 250 people. The goal is to open it for weddings, dinners and events in the spring or summer, Williams said. In the future, he said the board is looking at adding more clubhouse facilities, programming and activities. The board will decide upon additional plans for the church after listening to what members would like to have, he said. The Westmoreland Club also has an agreement of sale to purchase the Jewish Community Center’s long-time property at 60 S. River St. in Wilkes-Barre. The JCC is moving to a new location in the former Price Chopper building on Third Avenue in Kingston. Once it moves, the JCC plans to demolish the South River Street property and the Westmoreland Club will use it for parking, Williams said. The JCC plans to partially occupy the Kingston facility early this year and final completion is scheduled for July. After the two sales are complete, Williams said the Westmoreland Club will have a campus with two clubhouses and a total of 170 parking spaces. The Westmoreland Club has seen a demand for larger space for events and is seeing an increase in club member events, he said. Last year, he said club member events increased by 20 percent. Many young members and their families have joined the Westmoreland Club over the last several years and there was a need for additional space, he said. Wilkes-Barre Councilman Tony Brooks, who also is director of the Wilkes-Barre Preservation Society, said the sale is an example of a preservation success. He’s excited that the church will be restored and preserved and that the property and the Jewish Community Center will go back on the tax rolls. As nonprofits, both were previously not on the city’s tax rolls. According to history he provided, First Baptist Church is the youngest of the downtown’s monumental churches that was built during 1931 and 1932. It was designed by Wilkes-Barre architect Thomas A. Foster in a 14th century “Collegiate Gothic” style. The church’s Daniel C. Roberts Tower, a square belfry rising more than 100 feet and housing a peal of 12 chimes, is a prominent landmark on the downtown skyline while the church’s west wall facing South River Street boasts one of the largest traditional stained glass windows in Northeast Pennsylvania. First Baptist Church is the third major downtown Wilkes-Barre church to be saved and readapted, he said. The others are Memorial Presbyterian Church on West North Street, which was purchased by King’s College, and First United Methodist Church on North Franklin Street, which was readapted by Downtown Arts. Throughout downtown Wilkes-Barre, Brooks said there is a long list of restoration projects underway at historic buildings, including the Irem Temple building, the Spring Brook Water Supply Co. building, the Hotel Sterling annex building and the Market Street Square complex. A Victorian mansion at 259 S. Franklin St. is being turned into a private home and a dental office. The Luzerne Foundation moved into a century-old building at 34 S. River St. Plans are moving forward to transform the Zebulon Butler House, the oldest house in Wilkes-Barre at 313 S. River St. built in 1793, into a historical museum. Other restoration projects in downtown Wilkes-Barre have included turning buildings downtown into apartments such as the PNC Bank building and the Alleghany building. 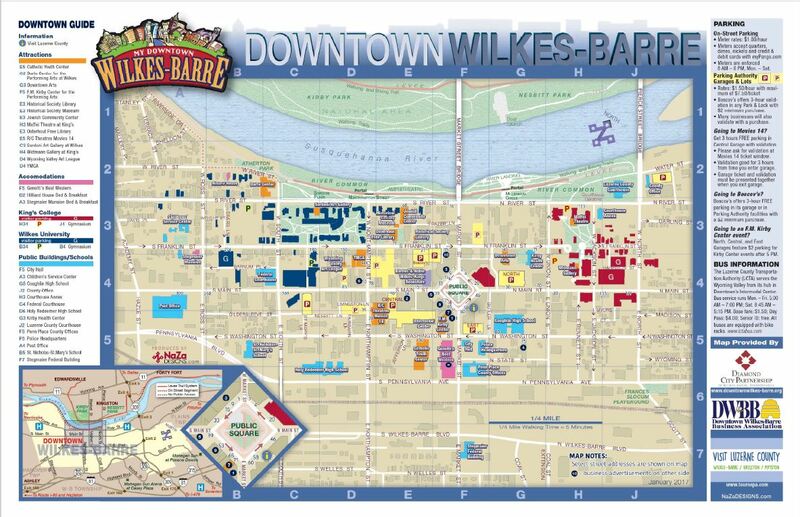 “When you take all these projects together, it shows that Wilkes-Barre is taking historic preservation very seriously and it proves that it’s part of economic development,” Brooks said.